Tokyo, Nov 8 US Vice President Mike Pence is set to visit Japan next week and discuss issues related to North Korea with Japanese Prime Minister Shinzo Abe, it was announced here on Thursday. 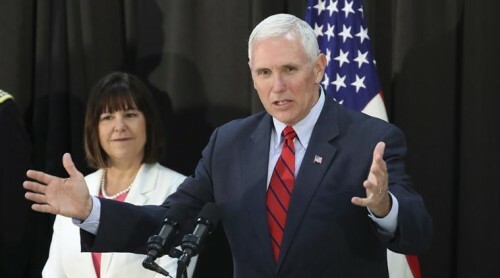 Pence will stop in Japan on his way to Singapore, where he will participate in a summit of the Association of Southeast Asian Nations, which will begin on Tuesday, Efe news reported. Japan's Chief Cabinet Secretary Yoshihide Suga confirmed Pence's visit to Tokyo and his meeting with Abe next Tuesday before the US leader leaves for Singapore on the same day. Suga said that the meeting will be a good opportunity to strengthen bilateral relations on pressing issues like North Korea. The minister did not give details of the topics to be discussed, although Tokyo has been closely following the process of North Korea's denuclearization, an initiative of the US administration led by President Donald Trump. Pence will arrive in Tokyo days after Washington postponed a meeting between US Secretary of State Mike Pompeo and a North Korean delegation. Suga refused to comment on the results of the US mid-term elections and said the US-Japan alliance remained firm. In a press conference on Wednesday, Trump alleged that Japan did not treat the US "fairly" in their trade relations.